Of Wiarton, peacefully surrounded by her children at Grey Bruce Health Services Wiarton on Wednesday, January 14, 2015. 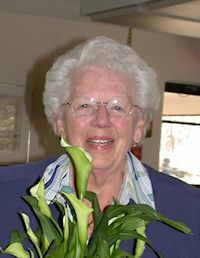 Florence Lillian Dubois (nee Parkinson) at the age of 94 years. Cherished mother of Donald (Marsha), of Wiarton, Diane (Ken Carter), of Cambridge, David (Heather Hill), of Orillia, Margaret (Gary Hedges), of Cambridge, and Pauline Dubois (David Blair), of Waterloo. Beloved grandmother of 12; and great-grandmother of 11, with 3 more expected in March. Sadly missed by her many friends at Limpert Lodge Senior Apartments. Predeceased by her parents Charles and Vera; husband Paul (2007); brother Charles; and sister Peggy Murray. A private Memorial Gathering will be held at the Thomas C. Whitcroft Peninsula Chapel, 272 Berford St., Wiarton (519) 534-5341. Cremation with spring interment in Pond Mills cemetery, London. Donations to the Lung Association or Diabetes Association would be appreciated.